طباطبایی مواهبی, مهوار, خدابنده, مهدی, سیف, احمد. (1395). کنترل پیش‌بین هایبرید مبتنی بر مدل PWA برای فرایند خنثی‌سازی pH با لحاظ تغییرهای نرخ حجمی بافر. نشریه شیمی و مهندسی شیمی ایران, 35(3), 127-135. مهوار طباطبایی مواهبی; مهدی خدابنده; احمد سیف. "کنترل پیش‌بین هایبرید مبتنی بر مدل PWA برای فرایند خنثی‌سازی pH با لحاظ تغییرهای نرخ حجمی بافر". نشریه شیمی و مهندسی شیمی ایران, 35, 3, 1395, 127-135. طباطبایی مواهبی, مهوار, خدابنده, مهدی, سیف, احمد. (1395). 'کنترل پیش‌بین هایبرید مبتنی بر مدل PWA برای فرایند خنثی‌سازی pH با لحاظ تغییرهای نرخ حجمی بافر', نشریه شیمی و مهندسی شیمی ایران, 35(3), pp. 127-135. طباطبایی مواهبی, مهوار, خدابنده, مهدی, سیف, احمد. کنترل پیش‌بین هایبرید مبتنی بر مدل PWA برای فرایند خنثی‌سازی pH با لحاظ تغییرهای نرخ حجمی بافر. نشریه شیمی و مهندسی شیمی ایران, 1395; 35(3): 127-135. Branicky M.S., "Introduction to Hybrid Systems", MSc. Dissertation, ECE, Case Western Reserve University Cleveland, OH 44106, U.S.A, 91-117. (2006). Jafari, M.R., Salahshoor, K., Adaptive Predictive Controllers Using a Growing and Pruning RBF Neural Network, Iranian Journal of Chemistry and Chemical Engineering (IJCCE), 30(2): 125-138 (2011). 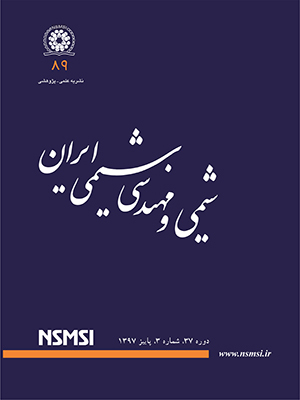 Nejati, A., Shahrokhi, M. and Mehrabani A., Adaptive Input-Output Linearization Control of pH Processes, Iranian Journal of Chemistry and Chemical Engineering (IJCCE), 27)3(: 25-35 (2008). بزرگمهری، رامین؛ احسانی­فرد، جواد؛ کنترل غیر خطی فرایند pH با استفاده از مد انتگرال کنترل کنندة لغزشی در حضور عدم قطعیت مدل، "نهمین کنگره ملی مهندسی شیمی ایران"، تهران، دانشگاه علم و صنعت ایران (1383). Lazar C., Razvan, P. and De Keyser, R., Nonlinear Predictive Control of a pH Process, “17th European Symposium on Computer Aided Process Engineering”, ESCAPE 17, Plesu V. and Agachi P.S. (Editors), Elsevier B.V., 27-30 May, Bucharest, Romania, 1-6. (2007). ملا احمدیان کاسب، حامد؛ کریم پور، علی؛ پرویز، ناصر؛ سیستم­های تکه­ای خطی تبار مستقیم: کلاس جدیدی از سیستم­های هایبرید با دینامیک­های خطی تبار و مرزهای کلیدزنی قابل تنظیم، مجله کنترل، (1)6 : 21 تا 29 (1391). Dumousseaud, C., "Physical and Biological Forcings on the Carbonate Chemistry in the North Atlantic Ocean", PhD. Dissertation, Faculty of Engineering, Science and Mathematics, School of Ocean and Earth Science, University of Southampton. (2010). Nekoofar M. H., Namazikhah M. S., Sheykhrezae M. S., Mohammadi M. M., Kazemi A., Aseeley Z., Dummer P.M.H., pH of Pus Collected from Periapical Abscesses, International Endodontic Journal 42: 534–538, (2008). Gomez J.C., Jutan A. and Baeyens E., Wiener Model Identification and Predictive Control of a pH Neutralization Process, IEE Proceeding Control Theory and Applications, 151)3( 329-338 (2004). Saad Saoud L., Fayçal R., Victor. T, Baddari, K., Modeling pH Neutralization Process Using Fuzzy Dynamic Neural Units Approaches, International Journal of Computer Applications, 28(4): 22-29 (2011). موحدی، محمد حسن؛ اسماعیلی، منصوره؛ راهکاری برای واحدهای فرایندی در بهینه سازی مصرف انرژی، مجله صنعت هوشمند، (1)16 : 42 تا 49 (1392). Herceg M., "Real-Time Explicit Model Predictive Control of Processes",PhD. Dissertation, ECE, Slovak University of Technology in Bratislava, Faculty of Chemical and Food Technology, Institute of Information Engineering, Automation, and Mathematics. (2009). Lazar M., "Predictive Control Algorithms for Nonlinear Systems", PhD. Dissertation, Gh. Asachi Technical University of Iasi, România. (2009). Necoara I., "Model Predictive Control for Max-Plus-Linear and Piecewise Affine Systems", PhD. Dissertation, University of Bucharest Geboren te Vrancea (Tulnici), Romania. (2006). Olaru S., Dumur D., Thomas J., Zainea M., "Predictive Control for Hybrid Systems, Implications of Polyhedral Pre-computations", in: Proceedings of the International Conference on Hybrid Systems and Applications, Lafayette, LA, USA, May 2006: Part II, Elsevier, 2(2): 510–531 (2008). Stevek J. and Kozak S., Matlab Toolbox for PWA Identification of Nonlinear Systems, in: "18th International Conference on Process Control", Tatranská Lomnica, Slovakia, 111-118, June 14–17, (2011). شفیعی، قباد؛ عارفی، محمدمهدی؛ جلالی، علی­اکبر؛ جاهدمطلق، محمدرضا؛ کنترل پیشبین غیرخطی پروسه خنثی­سازی pH بر اساس مدل وینر تکه­ای خطی، "یازدهمین کنگره ملی مهندسی شیمی ایران"، ایران، تهران، دانشگاه تربیت مدرس (1385).